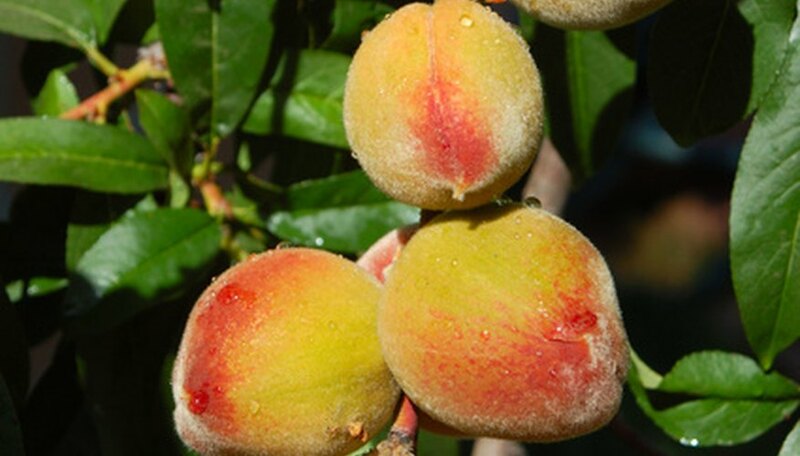 Peach trees can be a thing of beauty with their delicate spring blooms and juicy mid-summer fruit. Protecting them from insects is an important step in maintaining that beauty and the overall health of the trees. Peach trees can seldom get through a growing season without some sort of insect problem. Understanding which insects are attracted to peach trees, at what time of year and the appropriate insecticides to use can make the job of protecting them easier. Peach tree borers and lesser peach tree borers are the most common and destructive insects for peach trees. They feed in the bark of the tree. Stink bugs, plum curculio, mites and scales are also common and can damage fruit and foliage. Some of these insects or their larva overwinter either directly within the bark of the tree or in debris beneath and near the tree. Spray dormant oils on trees during the winter, or dormant period, of the tree’s cycle. Apply it before any green buds begin to break. Apply general purpose insecticides only before bud break and then not until after petal fall. Make subsequent applications of various insecticides at shuck split, 10 days after shuck split, in early June, early July, three weeks prior to harvest and again one week before harvest. For borers, continue post-harvest sprays into the fall. Dormant oil, such as Superior, works by smothering insects overwintering in the tree. For the treatment of aphids and plant bugs, the University of Florida IFAS Extension recommends imidan. In addition to these, malathion provides added protection and is effective against plum curculio, mites and Oriental fruit moths. The University of Delaware Cooperative Extension suggests thiophante-methyl or immunox for controlling Japanese beetles. Insecticidal soap is useful for treating aphids and psyllas, but due to its water solubility, you will need to reapply it frequently. Warm rainy weather is when many diseases can spread in peach trees, while warm dry weather is most conducive to insect population growth. Following a carefully planned and well-timed schedule for spraying insecticide is not only critical to providing adequate protection to the tree but also in ensuring that no harmful insecticides are present at the time flowers are being pollinated. The insecticides used to control pests are also harmful to pollinators such as honeybees. In addition to the potential harm to honeybees, using insecticides can be harmful to the tree owner, anyone applying the pesticide or harvesters, particularly if several trees or an orchard are involved. Wear protective clothing during application, including a breathing mask. If you spray one week or less before harvest, wear gloves when handling harvested fruit. Although the presence of insecticide on fruit should not be harmful if you are handling just a few pieces, if you are handling large quantities, there is a danger of absorbing the insecticide through your skin, eyes or nose.